We have all heard the somewhat overused phrase: “new year, new me”. It is usually regarded with a grain of salt. While resolutions can be important and exciting, why not make more of it –a New Year’s routine perhaps? Rolladium Family Fun Center is not only family owned –but family oriented. Countless customers have approached us, recalling growing up on skates, hanging out at the roller rink with friends on a Friday evening, the first time throwing on a pair of skates at a birthday party, etc. Some of the most valued conversations carried out between returning customers and management have been recollections of learning to skate at our facility and in turn, these customers have brought their children in to learn to skate. 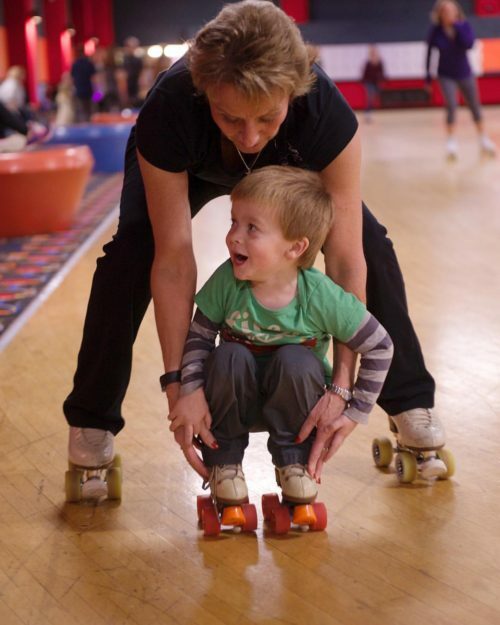 However, sessions can sometimes be a little hectic for little ones learning to skate for the very first time. For this reason, we offer Learn To Skate Classes every Saturday from 11:00am – Noon. Saturdays at Rolladium Family Fun Center are sure to be an incredible kick off to the weekend. When maintained consistently, roller skating burns up to 800 calories an hour! Why not start off your 2018 with a new tradition with the kids? Classes teach old favorites like shoot-the-duck, cross overs and two foot spins. Come one, come all, for a great beginning to the new year! *Only including skaters who participate in the class. Parents and siblings are more than welcome to join, but will have to pay admission for the session. I’m looking for adult classes please. Apologies for the late response. We have discovered missed comments while sorting through spam. What we have as far as adult classes go is our Tuesday Adult Coffee Skate from 10:00 am-Noon. It is a relaxed open skate, without having to worry about dodging little ones. A certified instructor will always be present to answer any questions you may have, or offer some tips for newer skaters. Where do I find pricing info for the Sat 11am learn to skate classes?